On a hot summer's day, there is nothing more refreshing than diving into a pool and feeling the invigorating rush of water refresh your skin. Even on mild summer nights, a few laps in the pool and some underwater diving can whisk away the troubles of the day. Swimming is an incredibly beneficial exercise for weight loss, strength and endurance, and is particularly recommended for those with arthritis, back injuries, muscular disabilities, and the elderly. When you have an in-ground pool, you have the means to improve your comfort, your health, and your enjoyment of life. Installing an in-ground pool will also improve the value of your home, and give you an elegant area for recreation and outdoor entertaining. Elaborate custom made in-ground pools can include built-in spas, decorative murals, and spouting water fountains. But even a simple vinyl-lined in-ground pool can spout some outdoor sophistication with simulated tile or soft floral designs. If you're ready to invest in an outdoor in-ground pool, start with researching prefabricated pool options and custom-made pool options. Prefabricated in-ground pools come pre-shaped. The traditional choices are an “L” shape, a standard rectangle, circle or oval, or a kidney shape. Custom pools can accommodate almost any shape. This is done by pouring concrete or gunite (a mix of concrete and sand) to dry into a custom-made frame. Vinyl liners and steel are used for custom pools and prefab pools. 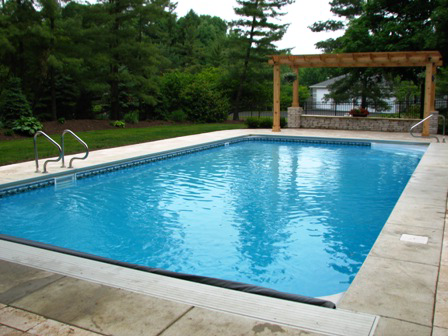 Fiberglass and aluminum are frequently used for prefab pool liners. The pool liner you choose must not only meet your aesthetic values, but it must cooperate with your climate as well. Fiberglass, metal and gunite are preferred materials in southern climates, but metal walls will heave and gunite might crack (depending on thickness) if exposed to the consistent harsh winters in northern climates. In-ground vinyl pools can survive winter hibernation because they are more flexible and can tolerate weather-activated soil movement well. Vinyl, fiberglass and metal liners each have properties that resist algae. Vinyl is pretreated to resist mold and algae, and fiberglass and metal liners are so slick that the culprits slide right off and can't cling to the pool walls. You'll find that most in-ground pool packages will include the filters and cleaning tools you need, as well as ladders and diving boards. Vinyl, fiberglass and metal are also treated to be fade-resistant. The liner is undoubtedly the most important part of the pool, but to complete your outdoor enjoyment, considerable consideration has to be given to your choice of poolside decking material and design. Prefabricated in-ground pool kits will often come with your choice of material for the pool ledge, and there are thousands of decking and landscaping options for your poolside perimeter. Your pool and pool area will quickly become a retreat for relaxation, refreshment, exercise, and recreation. If you're socially inclined, your in-ground pool will easily turn your backyard into the perfect venue for entertaining family and friends. Whether you like to test the waters, roll with the waves, or plunge right in, having the proper in-ground pool installed will keep you on the road to a healthier, happier life during the many summers to come.